The Dallas Art Fair is pleased to announce that the eighth edition of the fair will take place from April 14 through April 17 at the Fashion Industry Gallery (FIG). The Dallas Art Fair returns with 97 galleries from 17 different countries. With the eighth installment of the fair come 39 new participants, 33 of whom are international. With Dallas Arts Week comes a magnetic succession of programming: a solo exhibition featuring the work of Irving Penn will open at the Dallas Museum of Art, Karl Holmqvist will open at the Power Station, both Ann Veronica Janssens and Mai-Thu Perret’s solo exhibitions will be on view at the Nasher Sculpture Center, the Dallas Contemporary will celebrate the openings of Dan Colen, Helmut Lang, and Paola Pivi, and the Goss-Michael Foundation will open an exhibition featuring the work of Paula Crown. To purchase tickets please visit dallasartfair.com or call T 214 220 1278. The Patron Pass is an all-access pass to the most exclusive Dallas Art Fair events. The 2016 Patron Pass includes access to ten Dallas Arts Week events. To purchase your Patron Pass, please visit dallasartfair.com or call T 214 220 1278. More than 42,000 guests have attended the Dallas Art Fair since 2009. 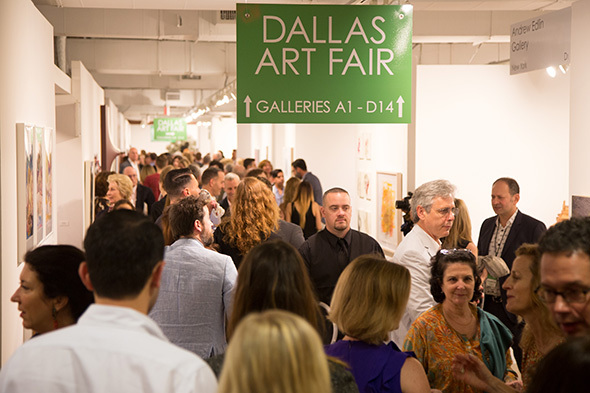 Located at the Fashion Industry Gallery—adjacent to the Dallas Museum of Art in Dallas’ dynamic downtown Arts District—the 2016 Dallas Art Fair will feature over 90 prominent national and international art dealers and galleries exhibiting painting, sculpture, works on paper, photography, video, and installation by modern and contemporary artists.